Turkey's foreign minister on Monday denounced the killing of 35 activists in Egypt who demonstrated against last week's military coup that unseated president Mohamed Morsi. "I strongly condemn the massacre during the morning prayers on behalf of the fundamental values of humanity that we have defended," Ahmet Davutoglu wrote in a message on Twitter. Morsi's Muslim Brotherhood said on Monday that 35 supporters were killed at dawn when security forces opened fire on them as they prayed. The Islamist group's political arm, the Freedom and Justice Party, called for "an uprising by the great people of Egypt against those trying to steal their revolution with tanks." 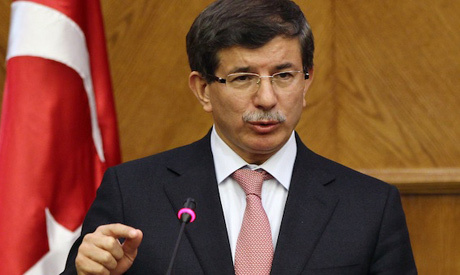 Davutoglu called for a process of normalisation in Egypt that respects the will of the Egyptian people. "Egypt is the hope for the rising calls for democracy in the Middle East and Turkey will always be in solidarity with the Egyptian people," he added. On Friday, Prime Minister Recep Tayyip Erdogan condemned the military intervention as anti-democratic and chastised the West for failing to brand Morsi's ouster a coup.